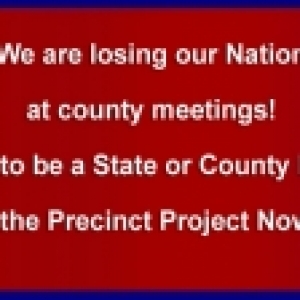 Apply to be a State or County Leader for Network America's Precinct Project system. 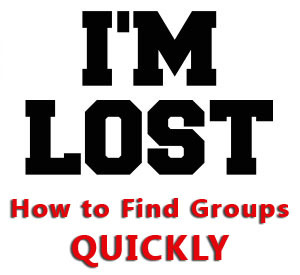 Add your information in the comments section below the pinned post. 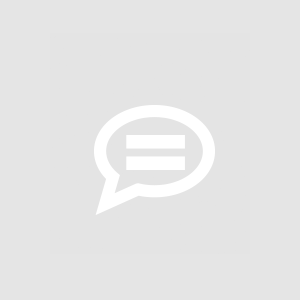 Add your name, state, county, and email. Job description: As a state or county leader, you help newcomers find their way around the system, help them find the resources they need to run for precinct, or other things they may want to do in the system. 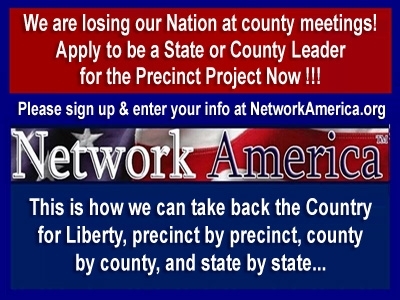 Apply to be a State or County Leader for Network America&apos;s Precinct Project system. 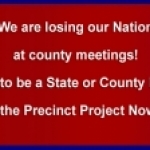 Each State and County Leader, once selected, will be directed to an orientation and can ask... moreApply to be a State or County Leader for Network America&apos;s Precinct Project system. WELCOME! PLEASE FOLLOW THESE SIMPLE STEPS UPON ARRIVAL! Admin Nicky	We have a conf call tonight, please check the schedule! There IS a Plan To Take Back the Republic - WHAT IS THE PRECINCT PROJECT? We encourage Liberty fighters to get involved as Precinct Captains/Chairs in their county, in the party of their choice, or as independents. The precinct captains elect county party leaders who endorse the candidates. Change the party leaders, change the lawmakers, and... moreThere IS a Plan To Take Back the Republic - WHAT IS THE PRECINCT PROJECT?